This is the first article in which, instead of limiting myself to exposing the established facts and theories of modern science, I indulge in adding a minimum of personal vision. Not so much in the concepts outlined, but in looking for a link between them. To take a step back to look at the forest instead of focusing on the trees. For this reason I need to mix together some arguments in the hope of highlighting the aspects that they have in common and to which we give different interpretations. The two complementary aspects that are the heart of this article are separation and vagueness. Obviously these are two concepts taken in their scientific use; separation is to be understood as the limit or boundary that separates two sets or a precise value that helps us to define the belonging to a class. On the other hand, what is mathematically “vague“, or as others say is “blurred“, or more properly “fuzzy“, is a concept in which the separation is not clear and in some cases it is not even possible to define it. In the pages that follow, I will try to clarify the meaning of these terms, but before we go into the math details, let’s take the long way round and spend some words on someone who used this vagueness as a weapon …a philosophical one. 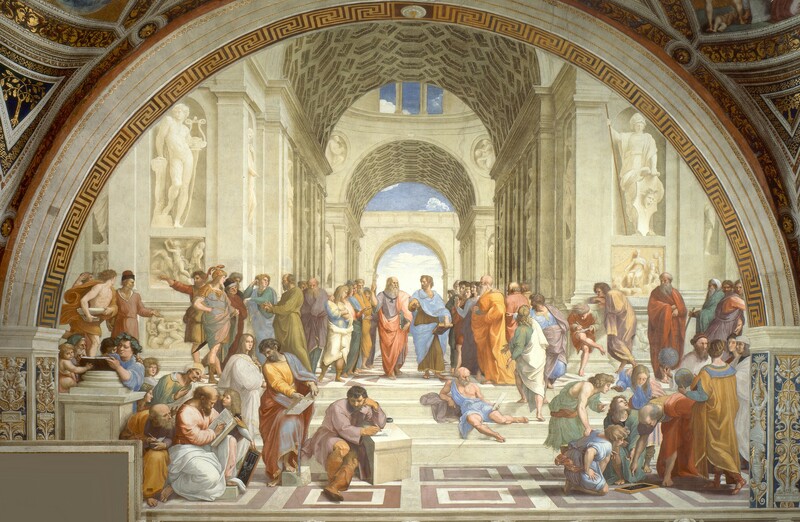 The image represented above is the famous “School of Athens” by Raffaello Sanzio, a fresco made between 1510 and 1511 to adorn the Signature Room for Pope Julius II (click on the image to see it in full screen …it worth it!) and in it there are represented the most famous philosophers of antiquity. 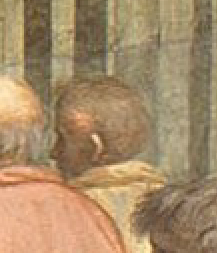 What’s interesting here is called Eubulides of Miletus and some scholars have identified him with the shady character in the group at the left of Aristotle, of which we see a clipping here. Eubulides was at the head of the so-called Megarian school, after his founder Euclid of Megara who founded it in the 4th century BC. A peculiarity of the school is the discipline of the eristic, an interpretation of the dialectic in which the art of verbal battle was carried out to the extreme. The megarians deepened the techniques of rhetoric for the sake of conflict, completely losing interest in the search for truth, to concentrate on the means of expression needed to assert one’s opinion against the adversary. Although this conception has ended up throwing a negative light on Sophist philosophy in general, it must be recognized that the philosophical research of the megarian school has gone through specific themes of logic that have been systematically addressed only in recent times. Eubulides’ philosophy, and its members at the megarian school, was basically based on a bipolar conception of truth. Since a proposition could only have two truth values, true or false, it was easy for them to come across situations where reason came to an absurdity. Since removing a grain of sand into a heap, what remains is always a heap, at what moment will the heap cease to be such? An analogous paradox is the bald paradox. Here too, the difference between a bald person and a haired one is perfectly clear, but if we suppose to remove a hair from a haired person, and then another, and then again … at what moment will that person become bald? By extension, one can adapt this reasoning to so many real situations in which you have to deal with entities composed of parts. Since not all the organs of a living being die in the same instant, at what point does a living organism become dead? Or in a more frivolous, if I have a puppet made up of many components, and this puppet is called Billy, and I’m replacing the parts that compose it, starting for example from one leg to finish at the head, at which point it ceases to be Billy? The Eubulides’ purpose was to use these arguments to show that truth does not exist or at least can not be reached by man. In fact, using strictly defined concepts, definitions, and arguments, one gets easily to absurdities as the ones outlined above. Reason fails where common sense has no difficulty in managing sand piles and people with few hair. The problem is obviously due to the fact that only the the two extremes are considered; heap or grain, bald or haired are the extremes of a continuous dimension. In reality, we have experience of all the degrees that this quantity can take, but when we have to use the logic we are led to simplify the real model to consider only the extremes: true or false. There is a need for paradoxes such as those above, to realize that for this to work you need to find a borderline, an amount precisely defined allowing to unequivocally distinguish the two extremes. How many grains we want to make a heap? How many hairs must have a haired person on his head? It may seem that once you have agreed on these discriminating values, the problem is resolved. But the boundary line may be quite vague.